I knew one day it would happen. It is inevitable with three children. But I pray every night to keep our family healthy. I worry that a simple cold, flu or stomach aliment will land Bug and/or SB in the hospital. Luckily it wasn’t the hospital but a stomach bug ended up forcing Diva, Bug and Hubs into a semi-state of consciousness staggering from bed to bathroom. I decide upon myself to not share a marital bed with my husband. And try to save any healthy germs I had left. I slept on our very uncomfortable and severely hated sectional couch in the living room. Besides the constant moaning of the wall AC unit it left me utterly deaf. Which is a huge issue if your trying to listen for that stomach turning noise of vomiting children. Finally, after the third sheet set change, I marched Diva into the bathroom and did what any good parent would do- made her a pallet and handed her a bucket with instructions. I prayed my little girl could get to one location or the other and my laundry was done for the night. But due to the jet noise the AC was now making I couldn’t hear her or get to her in time. That was it. I drug all my sheets and blanket off the couch and myself a pallet in the hall next to her. I was afraid to sleep. Every time I tried, she got sick. And she was so sick she had no idea what was going on and therefore I could not expect her to aim. And just as she had been asleep restlessly for a hour, I laid down trying to ignore the pain my stomach was immering. The entire time I was sitting there rubbing her back I was staring at the mirror and trying to decide what nasty bodily fluid was smeared all over it at midget-like height. I then decided I didn’t care, but I needed to clean it. And then it happened. Right as I was standing up to grab the windex, Bug stumbles out of his room clutching his mouth and…. Yea my stomach is still weak. Luckily SB slept threw it all and well Hubs, he spent his night on the floor of the master bath. I will go to bed praying tonight that SB does not get sick. We have to be as the hospital at 6AM for her surgery. Sigh, this will be a long week. 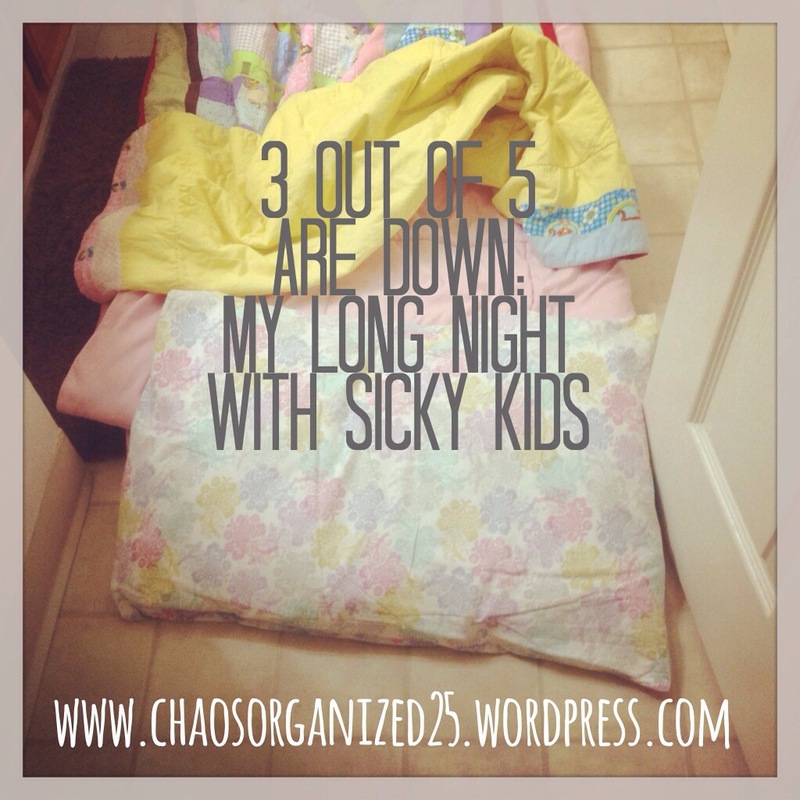 This entry was posted in Mommy Moment Mondays and tagged flu, illness, sick kids, sickness, surgery, tubes in ears, tummy problems, vomit. Bookmark the permalink. I just have one sick baby with a slight cold and I am about to break down!